A few years ago, writer and frequent Age of Aces contributer Don Hutchison came up to our table at PulpFest and handed us a manilla envelope, entrusting us with its contents. 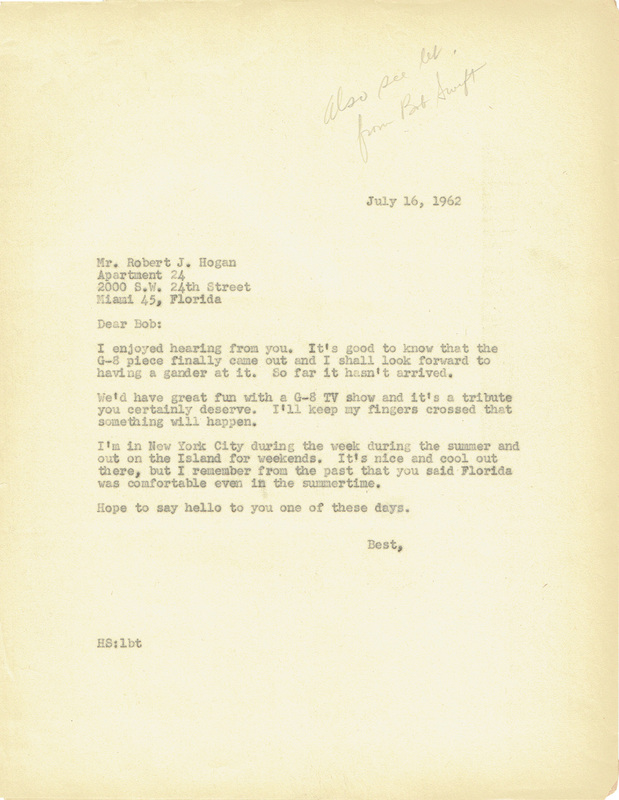 When we opened the envelope, amung other things, there were letters from Robert Hogan to Harry Steeger and back again. The correspondence continues. 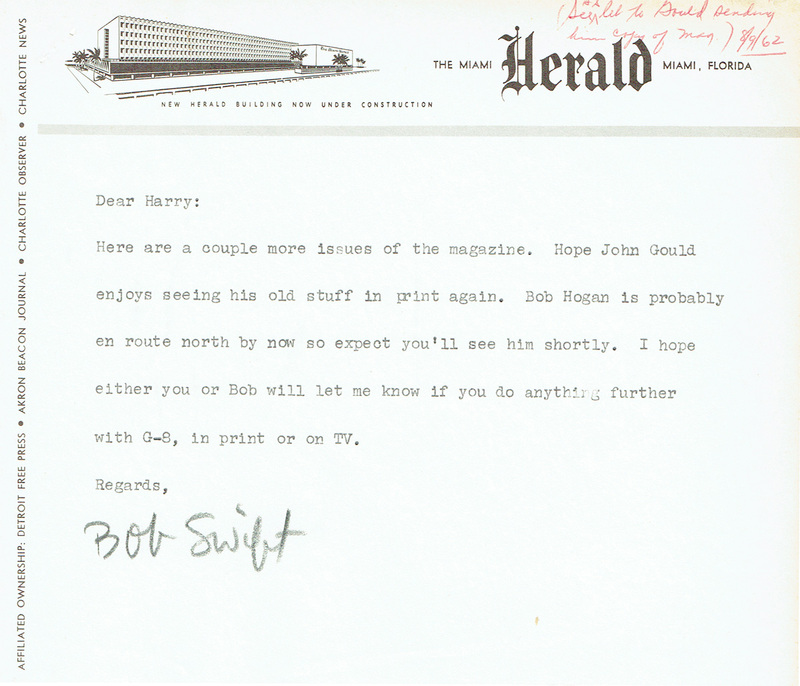 Bob Swift’s G-8 piece has been published in the Miami Herald Sunday Magazine Sunday July 8th, 1962. 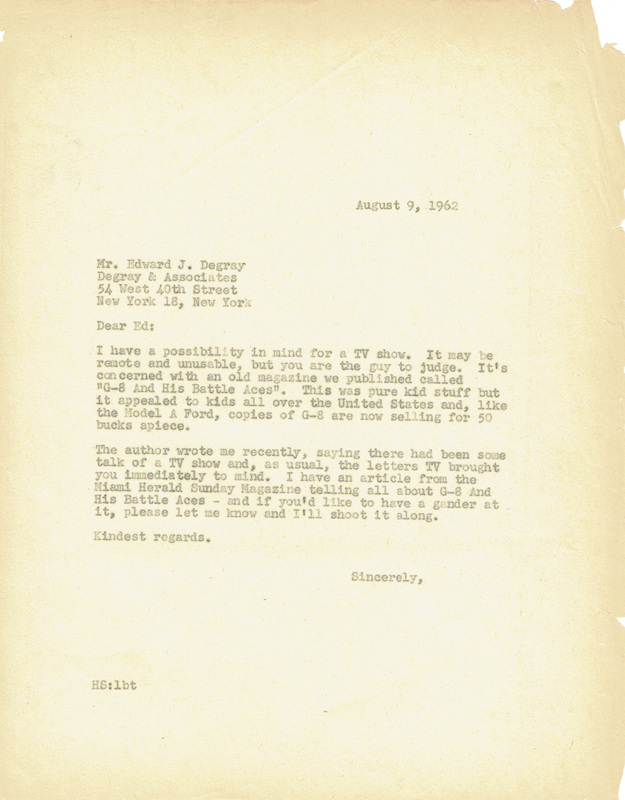 (Steeger did not include a copy of the article with his correspondence files and we have been unable to get a hold of a copy of this article otherwise). . . The G-8 piece finally came out and we all feel it was well worth waiting for. I saw Bob Swift yesterday and he said hed sent you a copy and returned the G-8 magazines you had sent him. So you should see it for yourself if you haven’t already. Bob Swift feels very strongly that G-8 should be a TV series and so do we all, of course. They’ve had about every type now except the World War One flying stuff and G-8 should do it well. I think if j:e could get a piece like this or this piece itself or an enlargement of this G-8 piece in a national magazine we might be on our way to the TV moneybags. We’re heading north July 26th so we’ll be there during August and probably the fall and hope I can drop in for a hello when we get into New York. A chance came along to rent our home down here to some nice folks until November 1st. They had to get in right off so we’ve taken an apartment here where we’ve been on similar occasions. Third floor and nice and cool. I enjoyed hearing from you. It’s good to know that the G-8 piece finally came out and I shall look forward to having a gander at it. So far it hasn’t arrived. We’d have great fun with, a G-8 TV shov and it’s a tribute you certainly deserve. I’ll keep ay finders crossed that something will happen. I’m in New York City during the week during the summer and out on the Island for weekends. It’s nice and cool out there, but I remember from the past that you said Florida was comfortable even in the summertime. Hope to say hello to you one of these days. That’s a great article! I got such a kick out of it that I practically drooled nostalgia all over my desk. The Miami Herald Sunday Magazine and your letter arrived just a few minutes ago and I read each of them immediately. You did the job to perfection and I congratulate you for having captured so well all the delights and joys of a 14-year-old’s heart. 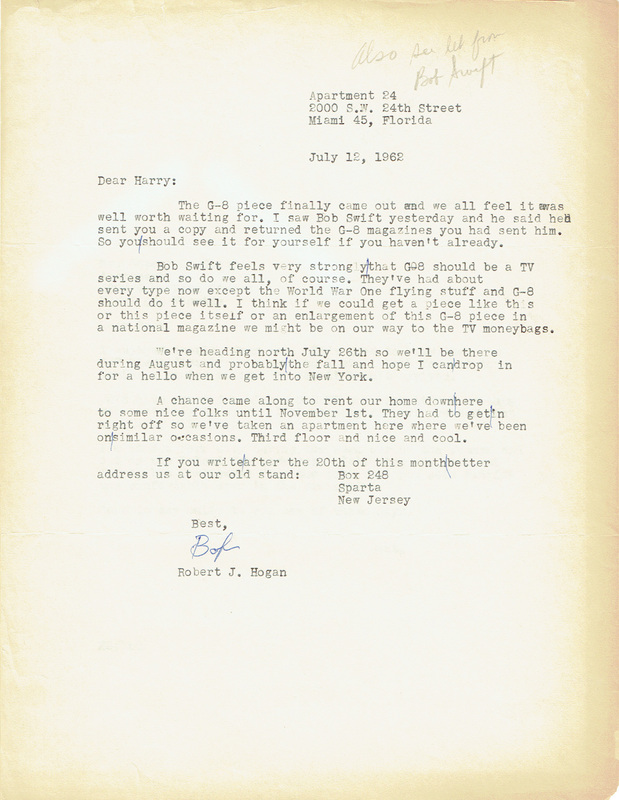 I know Bob Hogan himself enjoyed your article very much because I had a letter from him yesterday in which he told me about it. I hope it gets around to all the places where it will do the most good. 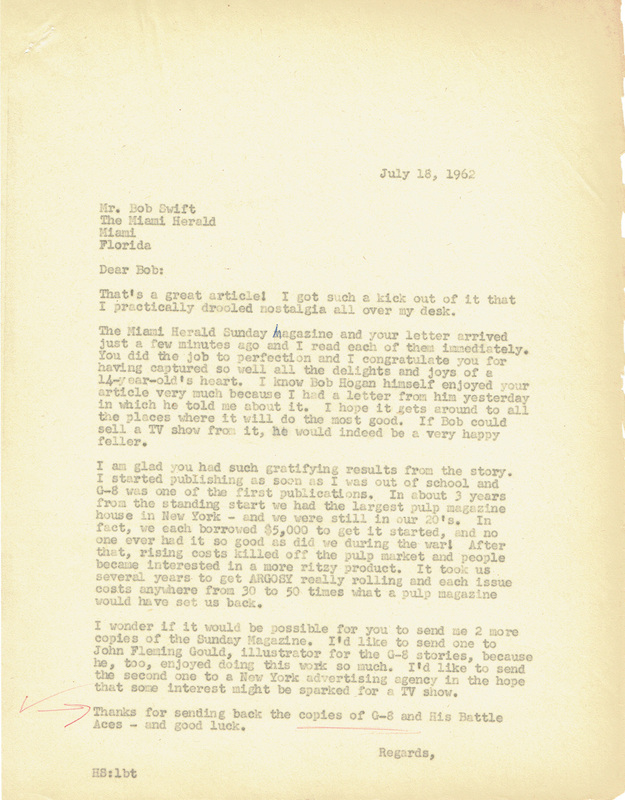 If Bob could sell a TV show from it, he would indeed be a very happy feller. I am glad you had such gratifying results from the story. I started publishing as soon as I was out of school and G-8 was one of the first publications. In about 3 years from the standing start we had the largest pulp magazine house in New York – and we were still in our 20’s. In fact, we eacj borrowed $5,000 to get it started, and no one ever had it so good as did we during the war! After that, rising costs killed off the pulp market and people became interested in a more ritzy product. It took us several years to get ARGOSY really rolling and each issue costs anywhere from 30 to 50 times what a pulp magazine would have set us back. I wonder if it would be possible for you to send me 2 more copies of the Sunday Magazine. I’d like to send one to John Fleming Gould, illustrator for the G-8 stories, because he, too, enjoyed doing this work so much. I’d like to send the second one to a New York advertising agency in the hope that some interest might be sparked for a TV show. Thanks for sending back the copies of G-8 and His Battle Aces – and good luck. Here are a oouple more issues of the magazine. Hope John Gould enjoys seeing his old stuff in print again. Bob Hogan is probably en route north by now so expect you’ll see him shortly. I hope either you or Bob will let me know if you do anything further with G-8, in print or on TV. Many thanks for sending along the two copies of G-8. I’ll use them where they’ll do the most good, I hope, and if there are any TV or other offers I’ll keep you advised. I have a possibility in mind for a TV show. It may be remote and unusable, but you are the guy to judge. It’s concerned with an old magazine we published called “G-8 And His Battle Aces”. This was pure kid stuff but it appealed to kids all oyer the United States and, like the Model A Ford, copies of G-8 are now selling for 50 bucks apiece. 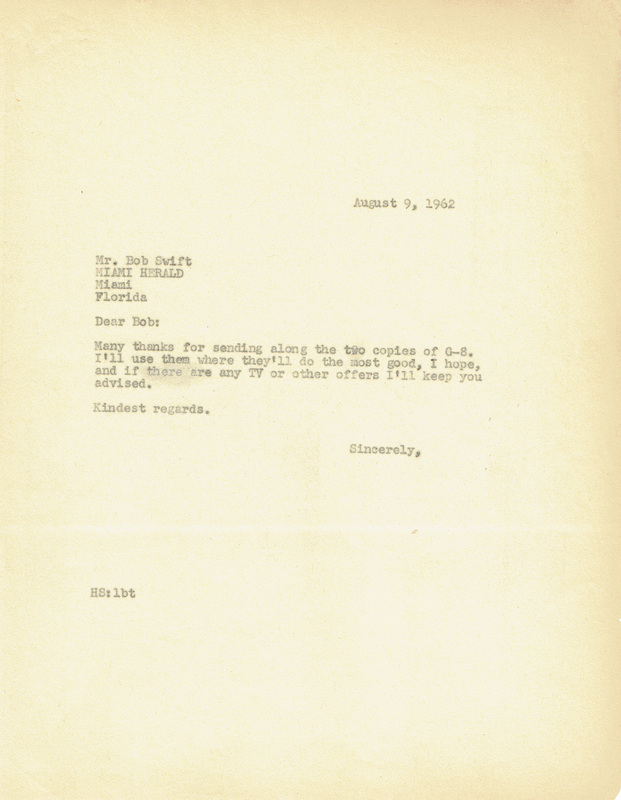 The author wrote me recently, saying there had been some talk of a TV show and, as usual, the letters TV brought you immediately to mind. I have an article from the Miami Herald Sunday Magazine telling all about G-8 And His Battle Aces – and if you’d like to have a gander at it, please let me know and I’ll shoot it along.